The landscape of geospatial software, listed by categories. A high-level summary of the geospatial software ecosystem. 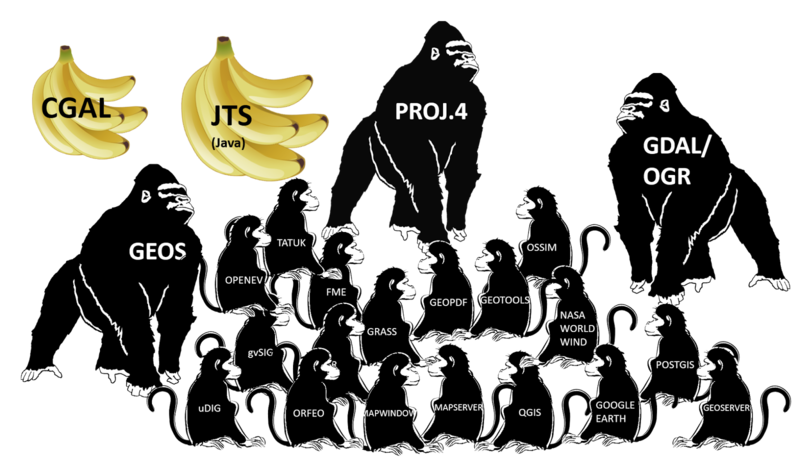 The "800-pound gorillas" including GDAL, PROJ and GEOS are the foundation of nearly all other geospatial software; CGAL and JTS are the reference implementations for many of the algorithms used by GEOS. GDAL was originally developed by Frank Warmerdam in 1998, until maintenance transferred to OSGeo in 2006. GeoTools is an open source (LGPL) Java code library which provides standards-compliant methods for the manipulation of geospatial data. GeoTools is used by many Web Feature Servers, Web Map Servers, and desktop applications. A list of projects provided on GeoTools wiki is: uDig, Spearfish, Sound Velocity, WorldImageReader, NOAA/NCDC Java NEXRAD Viewer, Virtual GIS village, Balloon Project, Spatial Data Integrator, AtlasStyler, GeoPublisher. CGAL (C++ Geometric Algorithms Library) is a software project that provides easy access to efficient and reliable geometric algorithms in the form of a C++ library. CGAL is used in various areas needing geometric computation, such as geographic information systems, computer aided design, molecular biology, medical imaging, computer graphics, and robotics. geopython has a few geospatial Python projects, mostly OGC-compliant web services. Marble: Virtual globe with multiple projections, tiles and vector data, routing and POI search. GpsPrune: View, Edit and Convert GPS trajectories. General GIS viewing, editing, and analysis. There's a slew of destop GIS software, but I recommend sticking to the best. If you are really attempted to see how they differ from each other, here's a Desktop GIS Comparison Matrix nicely curated by Dragons8mycat. ArcGIS can be used for research, but no commercial use is allowed. Leavey Library PCs have ArcGIS & ATLAS.ti [Windows GUI for text analysis]. ArcMap/map document (.mxd) contain display properties of the geographic information, and optional customizations and macros. ArcGIS layer file (.lyr) stores the path to a source dataset, and other layer properties including symbology. Image Processing: remotely-sensed images, image classification. Earth Trends Modeler (image time series of environmental trends). Publishing spatial data to the internet. Applications targeted at a specific domain. OSGeo (Open Source Geospatial Foundation) is an NGO promoting free and open source geospatial software and data. OSGeo-Live is a self-contained bootable DVD/USB/VM based on Lubuntu, containing a wide variety of open source geospatial software. The following sections follows OSGeo-Live's main catalog Geospatial. OSGeo4W is a binary distribution of a broad set of open source geospatial software for Microsoft Windows. 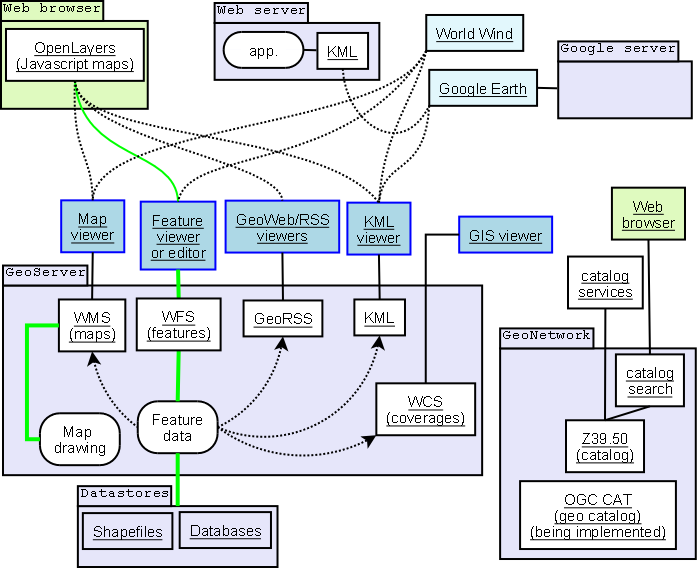 A framework model of OSGeo. GeoServer and GeoNetwork with interfaces and applications sketch. Green represents read and write paths. Dotted arrowed line indicates mostly read-only data flow. DebianGIS is a project for maintaining GIS packages in Debian's 'main' archives. It is the most mature repository among the above. 'gis-osm', OpenStreetMap parser, editor, viewer. 'gis-gps', GPS data (tracks) and sensors. On a normal computer desktop, you will most likely want to install at least the workstation task which contains most commonly used GIS applications.